Our firm provides services for individual customers for over 10 years. 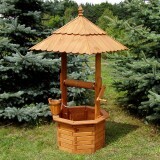 We specialize mainly in garden accessories. Products are made from wood, cane,, wicker, plastic and also from other materials. Our renown was achieved thanks to professional work and a high grade of products. For this reason, almost 100% of our products are exported to western contracting parties.